This 5/8 inch by 25 yard roll of satin ribbon with a beautiful scalloped edge will add elegance and style to your gift baskets and wrapped packages. Use it for Christmas decorations, wedding projects and baby showers. 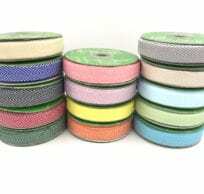 Available in 1 1/2 inch width and a variety of colors.